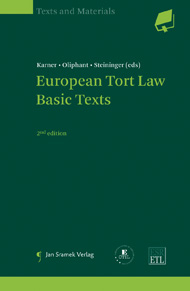 This unique collection makes available, in an expanded and revised second edition, English versions of basic tort law texts from almost all the legal systems of the EU and EFTA, as well as Russia and Turkey. It includes key provisions of national civil codes and other important legislative enactments, as well as extracts from leading cases. The texts were selected, and where necessary translated, by tort law experts from the respective jurisdictions.